For this TIP you need to have the Express Tools installed. One of the commands that I use all the time is the STRETCH. Sometimes it is a challenge to find my way through a drawing with a crossing polygon to stretch a house the two feet that the client changed. STRETCH is a great command but sometimes you need to stretch a several objects at one time. Within the Express Tools pull down menu, select Modify and then select MULTIPLE OBJECT STRETCH. The best thing about MULTIPLE OBJECT STRETCH is that if you know how to use STRETCH you really are not learning a new command; you are just learning a new way to use it. For this exercise I will use a simple drawing of several parallel lines to illustrate how this command can be used. The first thing I do is imitate the command using the process described above. If you like to type in your commands, type MSTRETCH on the command line. Now AutoCAD wants to know what you want to stretch and prompts you to pick points. The default option is a crossing window but you can change this option to use a crossing polygon. I am just going to leave it as a crossing window and pick a box around the endpoints of 3 pairs of lines. As you can see the crossing window shows up as a different color, in this case magenta. Once you have the ends selected hit the enter key. Now AutoCAD prompts you to set a base point to stretch from. At this point the command is like the regular stretch command. Pick your base point and then key in a distance or pick a point to stretch to. You will notice that all the lines have stretched as requested. In this exercise I used a simple drawing to illustrate how to use this command. However, this command is very useful when there just seems to be no way to use a crossing polygon through a crowded drawing. Join in and write your own page! It's easy to do. How? 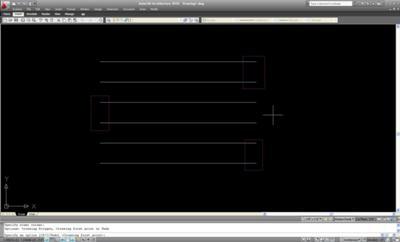 Simply click here to return to AutoCAD Tips.